A blog that started with a diary of childcare photographs. 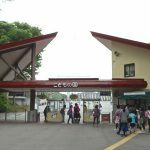 It is an English translation version of the blog "https://papataro.s-se.info/" which I am writing about the leisure spot I went with children. I think that there are many mistranslation, but I would be happy if you could see it with warm eyes. Yokohama Kodomo-no Kuni “Yokohama Children’s Country”. Farm and Children’s Zoo. 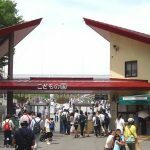 You can also go by bus from “Aobadai Station”. 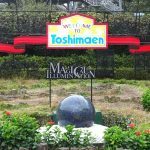 The degree of recommendation of [Yokohama’s Kodomono　kuni] is 4.0! I have written a review article of “Kodomonokuni” two weeks ago, but since I went again, I added an article. Please refer to the past two articles as well. We use the Denentoshi line from Shibuya. There are buses from “Aobadai Station” 2 stops from Nagatsuda station on the Shibuya side. Because there are book stores and pet shops in front of the station in Aobadai station, people do not mind the time to wait for the bus. 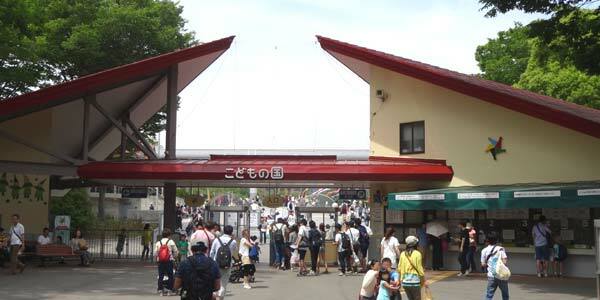 Certainly, there is nothing around Nagatsuda station, so it is a painful spot just to wait. However, there are only two buses in one hour depending on time, so it would be better to pick a good way to connect while checking the time with transfer guidance etc. Last time　On May 9th I went「kodomonokuni」 the parking lot vacant　was .because It was cloudy weather on that day and it was a weather forecast that it will rain from the afternoon. After 2 weeks May 23, the front parking was full as shown in the picture below. Also, although there are no pictures, there are also many cars in temporary parking lot (bokujyouguti parking lot). Since it is a good season to go play in the future, it is better to go as soon as possible when using a car. . Especially the time of the pool seems to be very crowded. 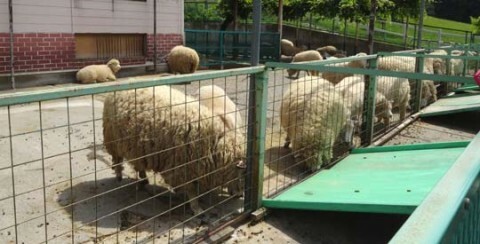 This time, I went to “Ranch”, “Children’s Zoo”, “Cubic Land” where the play equipment became new. Yukijirusi Megumiluk Group in Japan. 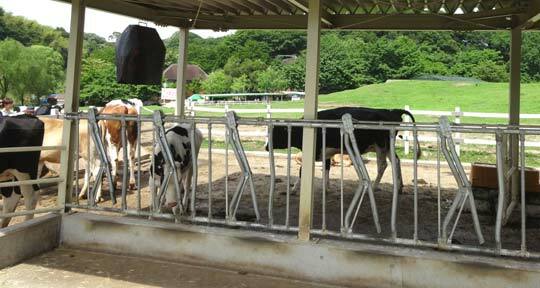 Apart from Kodomono-kuni　farm, there were also other sites. Ranch is one area inside children’s country. 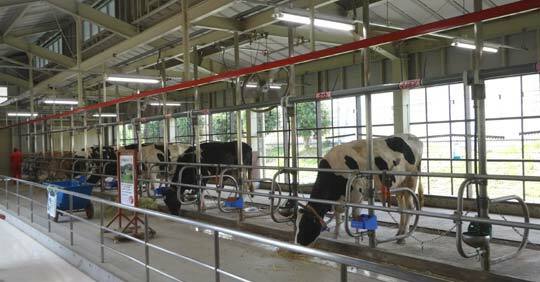 There is a barn so you can learn about milking. You can　let cows and sheep eat food , and there is the “Moomoo dome” introduced in the last article. It is inside the barn. Some cattle are grazing outside. Food is 100 yen per cup. The milking experience seems to have a limited number of people. Also milk milked at a pasture, candy made with that milk, soft cream are on sale. And next to the shop, “Momoji chan ? ?” is standing. I ate a soft cream next to this Momoji – chan. 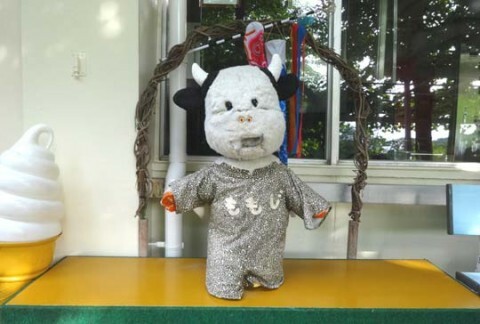 Several children saw Momoji, but the reaction at that time was contrasting and interesting. A small child said “cute.” But as an elementary school student, “Wow” was a bit somewhat avoidable word. The reaction difference was interesting. Children’s zoo is also one of the facilities in the ranch, but here entrance fee will be charged. Adult: 250 yen, Child: 200 yen. These animals are familiar animals such as goats, donkeys, geese, rabbits, chabos, raccoons and so on. 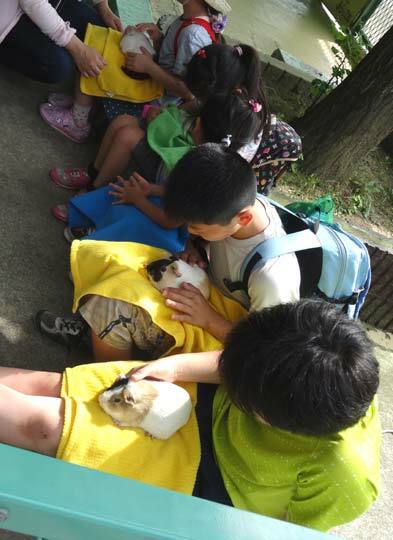 It is also possible to raise food (50 yen per a cup), you can watch it closely, touch it, you can hug rabbits and guinea pigs. It is a play equipment just opened in March 2014. It is on the north side of the ranch I introduced earlier. It is not far from the pasture, but it is in a place somewhat far away from the “fairy tale square” on the north side. When walking from the north side, this will be visible to the place where I walked the place where there is nothing for a while. Children who found this, ran to there ! Previously, there was a jungle gym of a box made of hexagonal wood here. it was rebuild playground equipment. 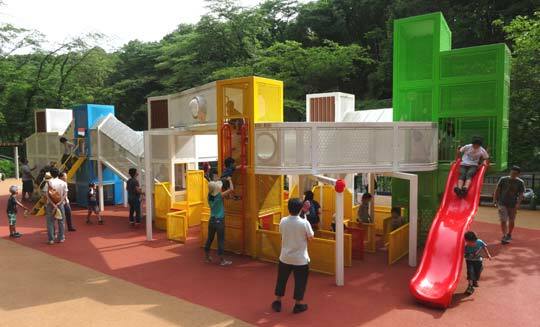 Even at the time of the former wooden box, it was a popular playground but it was a feeling that it became a more safe playground equipment. However, the mesh of the net used for walls of playground equipment etc. is small. From the outside parent’s perspective, I know that someone is there, but I do not know the face, so it is good to enlarge the stitch a little more for see the kid face. 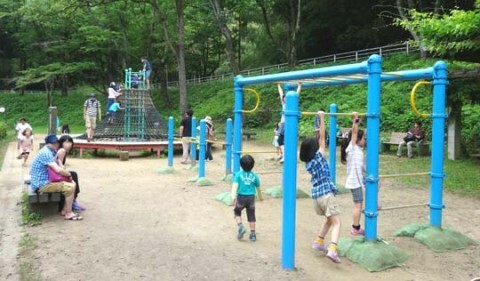 From the outside adults, there was a situation in which children who are crying in playground equipment do not know who’s kid, and even children inside can continue to cry because they can not find their parents. As the stitches become bigger, you can recognize the height of the play equipment clearly, you may feel that it is scary if it is a small child. However, I think that parents and children can be relieved if they can see their face. There are old-fashioned play equipment on the opposite side across the road. Near the cubic land there are ruins of ammunition warehouses used during the last great war. For details please read the explanation of the official below. which is making a lap around the park. It is 200 yen per person. It is a locomotive type bus that is traveling around the park. For the people who went for the first time, it is good to get on the first place to know what kind of place there is because the garden is wide. Besides, it is recommended when there are small children, and when you are tired. I am going to go to Kodomono-kuni with this condition. About half of the places I have not seen yet are left, so I would like to continue reporting! Field athletic Yokohama Tsukushino is also near! 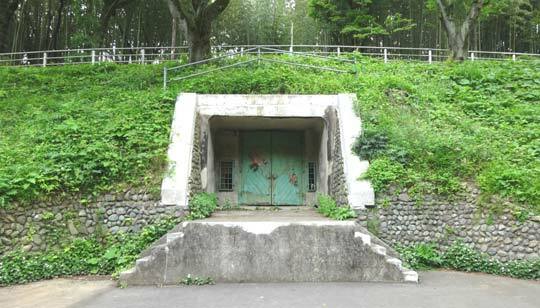 There is an athletic facility called “Field Athletic Yokohama Tsukushino” in a position close to “Kodomo no kuni”. I think that grade 2 to 6 grade are appropriate for elementary school students. Therefore, it may be that the target age of play is higher than the Kodomono-kuni. This place is also recommended. Field Athletic Yokohama Tsukushino can be played all day. Parking lot is free. If you think that this article was helpful, I hope you can share it on social media! ->The comment you input will be posted after approval by the administrator. 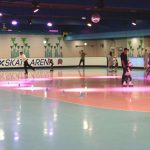 I went to the Roller Skate Arena in Tokyo Dome City. There are also shoes rental. Children often fall, but it is safe to not get wet even if they fall. Therefore, if you do for the first time, roller skating is more recommended than ice skating. Field athletic Yokohama Tsukushino is a field athletic field that goes from Shibuya station to Nagatsuda station which arrives in 30 minutes.It costs around 2000 yen ~ 3000 yen to play for the day and cost performance is also the best! Clothes change and gloves are required. The parking lot is a bit far, but maybe a car is better. Introduction of “Children’s nation” in Yokohama. Various playground equipment is in the wide park, and even if you play for the day you can not play at all. It is exactly a childhood country. There is also a nature rich mountain path, you can enjoy a whole day! I went to Ichigaya Fish Center of Fishing Holes! There are carp fishing and goldfish fishing, and it is a fishing pit which even beginners can enjoy. It is with one point advice on how to fish “Fishing in such fishing!” Just cost performance is not good. How to enjoy tomorrow with great advantage.Tickets to Yahoo auctions and gold certificate shops! Targeted Free Pass target price 1200 yen. Let’s get a ticket with great advantage and let’s enjoy it all day. The target is February, May, November. How about that? And the recommended attraction is the mystery zone of the night! ! It is doubling the fear if you ride alone. “Heiwa-no-mori Park Field Athletics” is a full-fledged cheap facility. There is also a parking lot. “Heiwa-no-mori Park Field Field Athletics” in Ota Ward is a facility established by the municipality, so the price is cheap! But since it is aimed at elementary school students and above, it is full-scale! 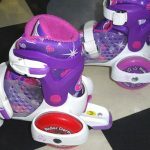 I will deliver the information we compared and examined variously for my first time to buy roller skates, inline skates. Roller skating is a beginner but I have myself in information gathering and analysis! Introduction of children in Yokohama. There are various playground equipment, and even if you play for the day you can not play at all. Just a child of children. 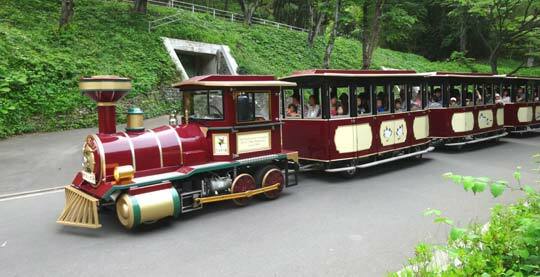 Introduction mainly of ranch, child zoo, newly established cubic land. It also introduces the ammunition store trace. Copyright© Rare beast to our house / Child's growth picture diary , 2015 All Rights Reserved.